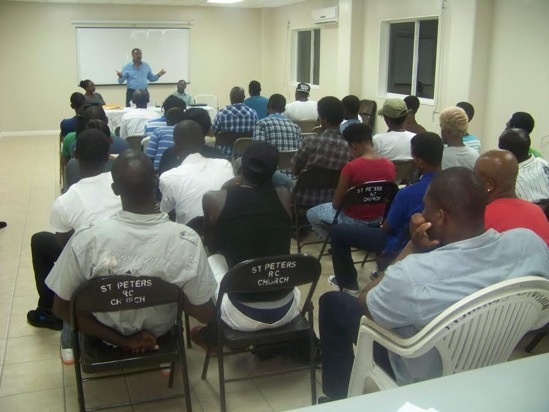 Seafarers from Grenada, Carriacou and Petite Martinique are moving to acquire new skills and certification in basic safety at sea. The Basic Needs Trust Fund (BNTF) will support about 100 seafarers to participate in Standard of Training, Certification and Watchkeeping (STCW). The programme will be conducted in Trinidad at the Caribbean Fisheries Training and Development Institute (CFTDI), which offers training and certification in accordance with the International Maritime Organization (IMO) standards. In addition to improving safety practices at sea, certified persons will also be in a better position to seek employment in the marine sector. 12 persons were trained in 2014 with support from BNTF. Speaking at the orientation session yesterday (21 September, 2015) at the Gouyave Fishing Complex, Minister of State in the Ministry of Agriculture, Honourable Alvin DaBreo urged the seafarers to take advantage of this opportunity and to make Grenada proud. He spoke of the financial and social burdens placed on families when seafarers get injured or suffer losses at sea. BNTF’s Project Manager, Mr Isaac Bhagwan, spoke of the importance of certification and noted the high enthusiasm among the target group. The first batch of 14 seafarers, including 2 women from Carriacou, will leave Grenada on 27 September, 2015 for Trinidad. The training will be conducted over 9 days. Three batches of seafarers will be trained by the end of 2015 and 5 other batches between February and June, 2016.